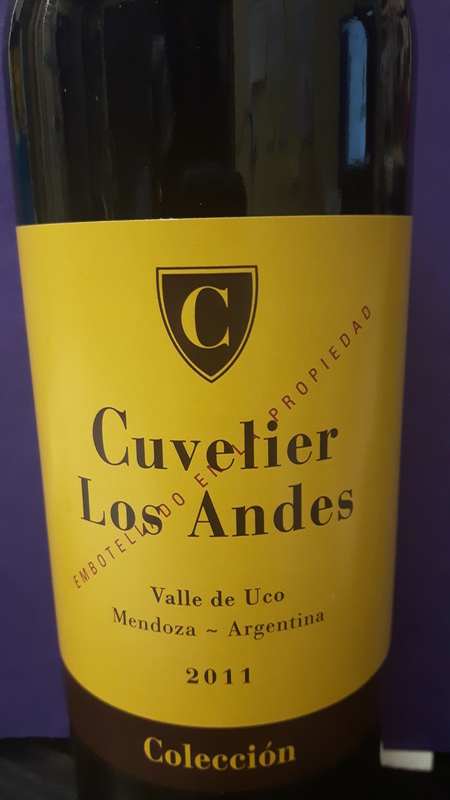 Today’s wine is the Cuvelier Los Andes Colección. A blend of 58% Malbec, 18% Cabernet Sauvignon, 12% Petit Verdot, 8% Syrah and 4% Merlot. A little cornucopia of grapes allowing them to add different things to the mix. I like that about blends and trying to figure out what other grapes might be involved as they certainly bring their little personalities into the mix. Petit Verdot for a little tannic backbone, Syrah for that aromatic lift, Cab Sauv for flavour and structure, and Merlot for softness. It works! And yes, French winemakers are involved! Cuvelier is a French family that owns Châteaux in Bordeaux,including Château Léoville-Poyferré and Château Le Crock since 1903. Bertrand and Jean-Guy Cuvelier purchased land right below the Andes Cordillera and planted a vineyard. All grapes are picked by hand, and a certain famous wine consultant by the name of Michel Rolland gave them advice in the winery to come up with this fabulous wine. What’s cool about this area is that it has that great diurnal range – the grapes have lots of sunshine and warmth during the day, but it cools off substantially at night (due to their proximity to the Andes) to keep the grapes from ripening too fast and keeping the acidity high in the grapes. It’s a great little microclimate for growing grapes and this is a wine that I’d be happy to drink, to serve and have served! It’s very plush, with huge mouth feel (it DOES have 15% abv) with dark fruits of plum, mulberry and blackberry, along with some spice notes of clove and pepper. Great acid structure and well balanced (even with that high alcohol) this is an extremely delicious, well made Argentinian wine! Salud! This entry was posted in Thirsty Thursday, Varietals and tagged Andes, argentina, blend, Bordeaux, Cabernet Sauvignon, Chateaux, French, Malbec, Mendoza, Merlot, Petit Verdot, Syrah, thirsty, Thirsty Thursday, Thursday, Uco Valley, wine, Winemaker. Bookmark the permalink.